We all need a treat sometimes. And when that treat need hits, you don’t want complicated recipes with tons of ingredients. You want something EASY. Something QUICK. Something that does not involve the oven. Yes, we’re talking sugar free fudge here – rich, satisfying and totally irresistible. I’m a big fan of both chocolate and peanut butter. Logically, combining these two ingredients makes the end result TWICE as amazing. On a cold November day like this a square of Keto chocolate peanut butter fudge will lift your spirits instantly. In fact, you’ll be thinking to yourself: November? Love this time of year! Traditional fudge is made with condensed milk. 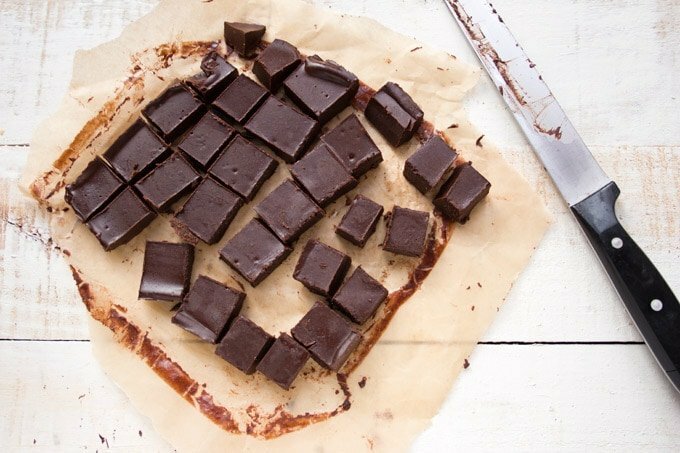 Whilst I have an amazing sugar free condensed milk recipe on my website, this chocolate peanut butter fudge recipe contains grass-fed butter to make it extra creamy. This recipe is a Keto fat bomb like no other, my friends. Rich, chocolatey, nutty fat-fuelled goodness! 1.) 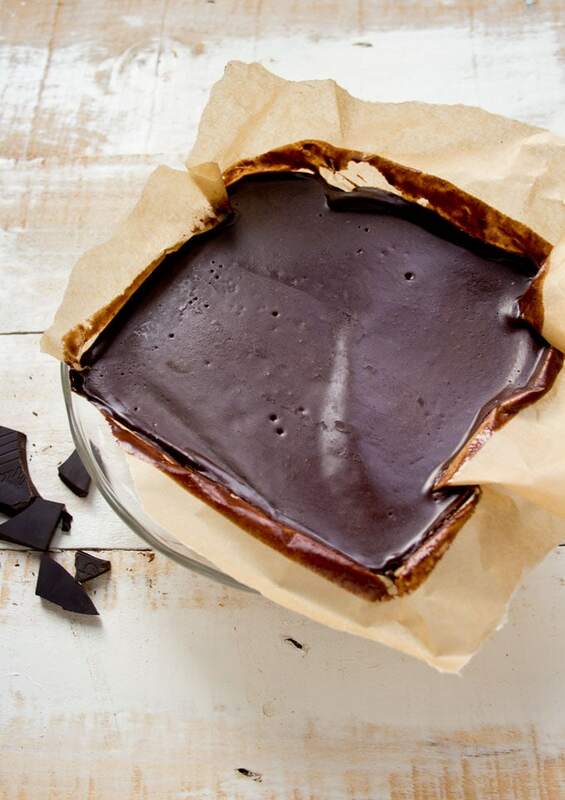 Melt the butter and the chocolate – on the stove over a low heat or in the microwave in 30 second bursts. 2.) Stir in the peanut butter and powdered sweetener. 3.) Pour into a small container lined with parchment paper and freeze until set. Check the label when you buy peanut butter! It should only contain one ingredient – peanuts. Supermarket brands often add unnecessary fillers such as palm oil or (gasp) sugar. Here in the UK I use the Meridian brand. In the US, this brand is popular. Alternatively, make your own peanut butter using the steps in this post. A quick word about chocolate: I used the 90 % dark chocolate by Lindt. It contains only 7 grams of sugar per 100g bar. Considering you use one bar to make the 30 fudge pieces, it’s fine by my book. If you decide to use unsweetened chocolate, make sure you increase the amount of sweetener accordingly. Another option is using sugar free chocolate such as Lily’s in the US or Balance in the UK. Keto chocolate peanut butter fudge can be made with smooth or crunchy peanut butter. Or give it a go with almond butter (and just rename it). You could add a pinch of salt for an extra kick. During the colder months, adding some cinnamon or cardamom will give your sugar free fudge a festive note. 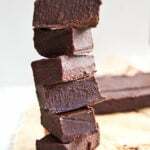 You can keep this fudge in the fridge or in the freezer ready for when you feel the need for a tasty, guilt-free pick-me-up. I love to have a freezer full with useful (=prepared) dishes for those days when you are after a quick fix, so that’s where my fudge lives. It tastes fantastic frozen as well as thawed, which brings out its full glorious creaminess. Because of its high fat content, the fudge is incredibly satisfying. I cut it into 30 squares. One square contains less than 1 net carb. I’d say 2 squares is a generous portion (or maybe that’s just me being greedy ;)). Looking for an easy and quick treat? 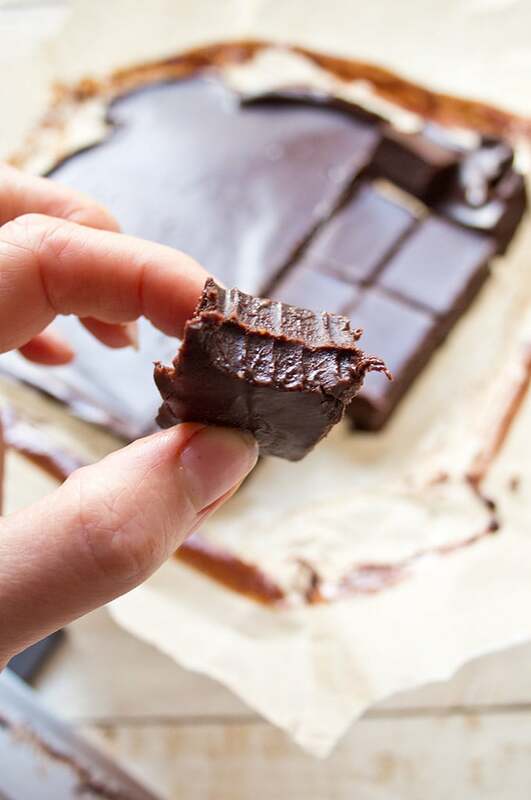 This Keto chocolate peanut butter fudge is finger-licking good. Even better, it's sugar free! Melt the butter and chocolate in a saucepan over low heat or in the microwave (in 30 second bursts). Remove from the stove / microwave. Stir in the peanut butter and add the sweetener to taste. Pour into a small container lined with parchment paper. Place in the freezer for ca 30 minutes until set. You should choose chocolate with at least 85% cocoa solids to minimise the sugar content. I like 90% chocolate. Store in either fridge or freezer and be perfectly prepared for the next snack attack! This recipe was first published in November 2016. The post was updated with more details and tips in November 2018. Just made this, by far one of the best recipe. So yummy! Thanks. Would adjustments need to be made if this were made without the peanut butter? I want to make these for my coworkers, but someone has a nut allergy. Thanks you so much! Those coconut bars look absolutely delicious! And totally going to try the PB Fudge recipe anyway for my family this weekend. This recipe looks fabulous thank you! I hate to be this person but is it possible to sub with coconut oil or anything else that is non-dairy? I’m very allergic to dairy but really want to make this. Thank you! Coconut oil behaves very similar to butter (as long as you use regular coconut oil and not MCT oil which stays liquid), so I’m sure you can use it in this recipe. Let me know in the comments how it turned out! I’m so glad you asked because I was wondering the same thing! Did you end up making this with the coconut oil? I’d love to know how it turned out!!! Thanks for this recipe, it sounds wonderful!! The recipe call for put it in a small pan to set and cool or freeze, what size was the pan? Can’t wait to make it! I made this quite a while ago, so from memory I used my 6×9 inch casserole dish, but made the surface a bit smaller by crunching aluminium foil on one end so it ended up being about 6×6 inch. Thank you!! It did look very small! How well do you think this would work if I used a mold to make individual shapes for the fudge? OMG!! Made this yesterday and golly such a great treat. Worked perfectly. Definitely keeping in the fridge for the Australian summer!! Thanks a bunch. Summer! You’ve got me dreaming now… Glad the recipe worked out for you!! Ooooh, macadamia butter…. I’m swooning right now!!!! Hi I love this recipe!!! struggling to correctly track my macros with it tho – do you know the weight (grams) of each serving worth 80 cals? If you cut the block into 30 squares, each square would weigh around 15g. Could you tell me what is vanilla essence? Is it the same as vanilla extract? Thank you and thank you for making it so much easier to eat low carb! This fudge is amazing- it’s so rich and creamy and really hits the spot. The hardest thing is not to eat it all at once! Can Cocoa do the trick if I can’t find unsweetened or the proper chocolate? I wouldn’t recommend it. The cacao butter in the chocolate is the firm part that holds everything together. Your end product would not have the same consistency. Do you use unsweetened chocolate in this recipe ? I used the Lindt 90% cocoa solids chocolate, which contains 7g of sugar per 100g or less than 1 gram per square. This was my go-to before I discovered unsweetened chocolate. If you want to use unsweetened chocolate, simply adjust the amount of sweetener to your taste. would almond butter work instead? Yes, any nut butter would work. Enjoy! Hi Patricia, 100g is the same as 3.5 ounces. I hope this is helpful? Great!! Shoot me a comment with your verdict when you’ve tried it! If I don’t have powdered can I use the granuals instead? Would it be the same amount? As the mixture is quite liquid in the beginning, powdered sweetener does work better. The granules are more likely to sink to the bottom and you’ll end up with super-sweet bits. You could try blitzing your granules in a food processor or with a stick blender to get them smaller. Alternatively, you could use stevia glycerite (liquid stevia) if you have it. It’ll be around the same amount whether it’s granulated or powdered – just adjust it to how you like it. just go ahead and put the granules In the blender and it will powder. Takes less than a minute! This fudge looks incredible! You can’t beat a chocolate-peanut butter combo! Thanks for the recipe!! Chocolate and peanut is just the best…glad you like it! My husband was recently diagnosed as pre diabetic…. so Im looking for sugar free recipes. Can you tell me where I can get the erythritol powder? If you don’t have a nearby health foods store, they’ll definitely have it on Amazon (as always). That’s the one danger with it!! Peanut butter & chocolate are so classic! And the texture of this fudge looks wonderful! 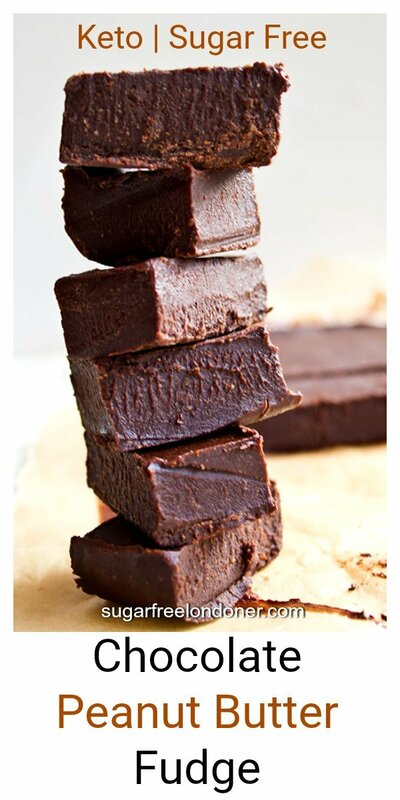 I love fudge and this looks like a must make! Thanks for sharing it! Glad you like it Elaine! 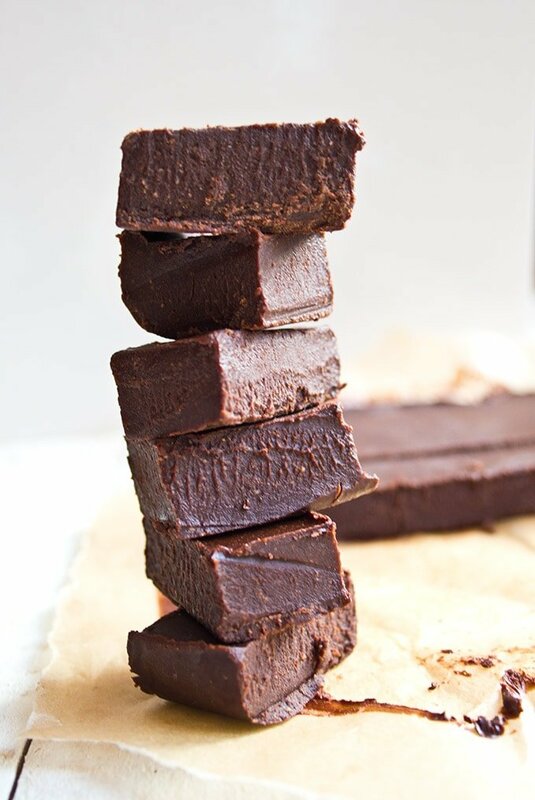 This fudge looks easy and delicious! Thanks for linking to my recipe!